Imagine you're having a heart attack. Your co-workers call 911, and the medics arrive. Under lights and sirens, traffic cleaves as the path clears to the hospital where doctors and nurses are waiting to administer lifesaving treatment. Now imagine that instead of going to the ER down the street, the medics are forced to take you to another hospital on the other side of town 20 minutes away. You are clutching your chest and dripping with sweat, but they explain that the nearest hospital is "on diversion"  temporarily closed to ambulances because of overcrowding in the ER. If you're lucky, those extra 20 minutes won't make the difference between life and death. But with heart attacks, minutes often do matter. Until recently, however, there has been an unanswered question in the medical world: How does hospital diversion affect survival of heart-attack patients? On its face, it might always seem wrong to bypass the closest hospital in an emergency. But the issue isn't so simple. A more distant hospital may specialize in the emergency care you need  for stroke or trauma, for instance. Or it may have doctors who already know you. Or, when some hospitals become too overfilled, doctors and nurses may deem it safer (for you and the other patients waiting) to go elsewhere. According to a recent study published in the Journal of the American Medical Association (JAMA), they're right: in an examination of outcomes of heart-attack victims, researchers found that patients whose nearest hospitals had high levels of ambulance diversion (more than 12 hours per day) were more likely to die compared with those who lived near hospitals with no diversion. In the study, the authors looked at the records of Medicare patients who had a certain type of heart attack from four California counties from 2000 to '06. The average hospital was on diversion for eight hours a day  meaning that for one-third of the day it was closed to ambulance traffic. When the nearest hospital was on diversion for more than 12 hours per day, patients were significantly more likely to die (more than a 3% absolute difference) than those whose local hospitals did not go on diversion. A 3% difference in death rates may seem small, but put in the context of other health care interventions, 3% is enormous. For comparison, the difference in mortality between two major treatments for heart attack  using clot-busting agents vs. inserting a catheter to open a blocked artery  is less than 3%. That means that the systematic dysfunction that leads to ambulance diversion may be a greater contributor to mortality differences than even getting patients the best available treatment. The next logical question is: Why are California ERs so overcrowded that they are on ambulance diversion eight hours a day? The answer comes down to the basic laws of supply and demand. First, it isn't just California. 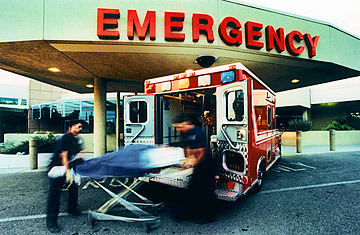 ER visits in the U.S. are rising everywhere, with 124 million visits in 2008. This number is expected to increase further when health reform is implemented and more than 30 million Americans get health insurance. And the supply of ERs is shrinking. Over the past 20 years, more than a quarter of the ERs in the U.S. have permanently closed. Another major cause of crowding and diversion is ER boarding, which occurs when patients spend long periods of time in the ER waiting to go to inpatient beds. Boarding ties up the ER so that doctors and nurses can't see new patients, which in turn prolongs everyone's waiting times and causes the ER to become overcrowded and divert ambulances. While the JAMA study results put very real mortality numbers on diversion, many previous studies have also found crowding and diversion to be dangerous. Nevertheless, some hospitals have been reluctant to fix it. (This, while the benefit of catheterization for heart-attack patient survival has driven tremendous investment to maximize its use.) Why? Partly because there has been a general lack of understanding about why crowding happens in the first place; until recently it was thought that crowding was an ER-specific problem, rather than a hospital-wide issue. Another hurdle is that it's expensive and time-consuming to solve crowding. Making a major change in any part of the hospital is a challenge. Fixing ERs, which are already chaotic, can be even harder. It involves not only addressing ER issues but also the operating rooms and intensive-care units  each of which has its own needs to consider. For example, one way to reduce ER crowding and diversion is to ask surgeons to operate on weekends. This reduces the peaks in demand for postsurgical hospital beds that occur during weekdays, which contributes to boarding. But who wants to work on the weekend? Weekends are for family and golf. Hospitals have to pay overtime to staff to keep the operating rooms open during these times, so getting buy-in from hospital staff outside the ER further complicates change. So what is the average patient to do about ambulance diversion? The unfortunate answer is not much, outside of asking your state legislator or your local department of health to propose eliminating it. But some proactive states have already taken the initiative and have banned diversion. In 2009, Massachusetts was the first such state. Studies have shown that there is little downside to banning diversion: hospital efficiency is actually minimally impacted after it is eliminated. The JAMA-study results and promising results from the Massachusetts experience may soon prompt other states to ban diversion too. Even better news is that hospitals will have more of an incentive to address crowding and diversion in the near future. There are currently plans for ER-crowding rates to be made available to the public through government websites in 2014. Public reporting can be a powerful motivator, especially when hospitals compare their numbers to their local competitors and worry that patients will do the same. Hospitals are also justifiably concerned that crowding may someday affect payment. Pay-for-performance incentives will become more common, with new value-based purchasing initiatives found in the health-reform law. For hospital managers, this means that fixing the systematic problems that cause crowding and diversion will become a major financial priority. Making real changes will require the entire hospital  and entire cities and states  to change the way they operate. This is not going to be easy because so many groups (doctors, nurses, hospitals, ambulance services) will have to work together to change. But as state governments and federal agencies put more pressure on hospitals to improve flow, by making hospitals publish their waiting times and potentially by exerting economic penalties, there may be little choice. Dr. Pines is the director of the Center for Health Care Quality, an emergency physician and an associate professor of emergency medicine and health policy at George Washington University Medical Center. Dr. Meisel is a Robert Wood Johnson Foundation clinical scholar and an emergency physician at the University of Pennsylvania.